Empowering Girls for over 10 Years! Why a program a program specifically for boys? Although boys and girls face many similar pressures and difficult situations in their school years, the way that boys experience and process these pressures and situations tends to be very different. 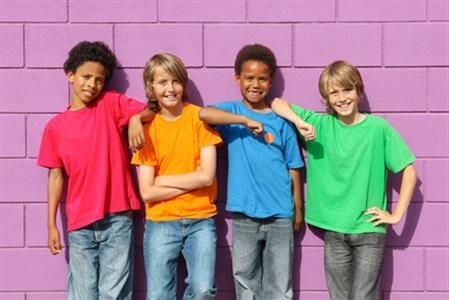 Boys also communicate much differently than girls and are more activity based. This program is designed specifically for boys. It meets them where they are at, so they will be comfortable and the program will be meaningful for them. What are the goals of the boys programs? 1. To help develop a strong sense of self in each participant. With a strong sense of self, participants will be comfortable with who they are and will be less susceptible to peer pressure. They will have the courage and strength to make healthy decisions for themselves. 2. To identify and regulate emotions. Participants will learn how to identify and have control of their emotions, as opposed to their emotions controlling them. Often times when people end up in bad situations or make poor decisions for themselves, it is because emotions were uncontrolled and the action was impulsive. Understanding emotion and controlling impulsivity leads to healthier decision making. 3. To discuss healthy versus unhealthy relationships and to identify the role that we play in relationships. 4. To provide opportunity for connection and community building. Boys typically are given lots of opportunities for competition, but not for connection. Getting to know who you are and being comfortable with it is at the core of this fun, interactive 8 week program. Activities and discussions will guide participants to think about and identify what their values are, what their interests are, and what is meaningful to them. They will discover that they have things in common with other group members which will lead to a sense of belonging and community which will strengthen their sense of self. All activities are designed to build cohesion and a sense of belonging among group members. We will discuss why boys are less likely to discuss their feelings and why that isn't healthy. The boys will learn how to identify what they are feeling and the thinking pattern that goes along with it. We will discuss how to use self talk and discuss strategies to deal with strong emotions such as stress, anxiety, and anger. The focus of this 8 week program is communication and healthy relationships - a healthy relationship with one's self and healthy relationships with others. Each week begins with a fun activity designed to build cohesion and a sense of community. Discussions and activities teach problem solving skills as well as strategies and tools to deal with frustration, stress, anxiety, and anger. We begin by discussing the pressures put on boys and boys are challenged to take a stand and change these expectations. Boys will learn healthy decision making skills, how to participate in a healthy relationship, and how to deal with strong emotions. WHAT ARE GLOW GIRLS SAYING? WHAT ARE GLOW LEADERS SAYING? “I have been leading the GLOW girls program for 2 years, and the continued enthusiasm is invigorating. I feel that the program has a multitude of benefits. We have created a space where we gather and everyone is encouraged to be themselves, share experiences, and try new things, without having to worry about judgement from others. The topics covered through the various GLOW themes are largely relevant to the girls visiting the program. The topic of cyber-bullying - which grew to discussions of bullying in general - brought up some great strategies for the girls to try in situations at school. Copyright © 2018. GLOW Program Inc. All rights reserved.